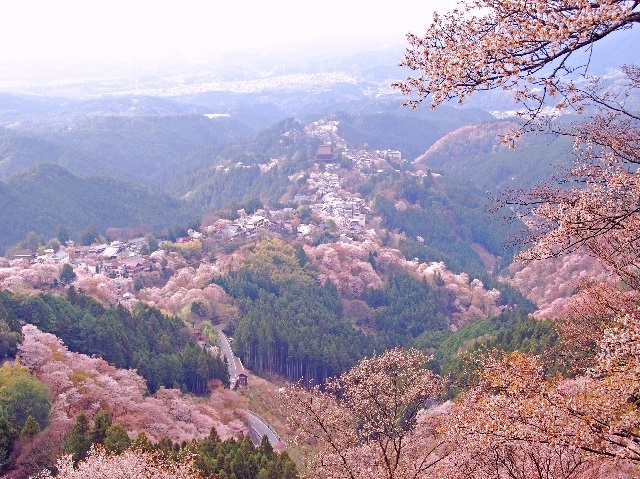 Noted as the finest site of wild cherry trees in Japan, visitors are invariably captivated by the sight of the entire slope of the mountain gradually becoming tinged by the color of cherry trees in bloom from the bottom to top of Mt. Yoshino in spring. There is an observatory set up at a lookout point where visitors can behold the commanding views of Mt. Kongou and Mt. Katsuragi in a distance, as well as the townscapes around Mt. Yoshino surrounded by greenery. The Omine Mountain Range is a profoundly mountainous area known as the Roof of the Kinki Region and comprises, from north to south, a series of famous peaks: Mt. Sanjogatake (birthplace of the Shugendo school of Buddhism), Mt. Hakkyogatake (highest peak in the Kinki region), and Mt. 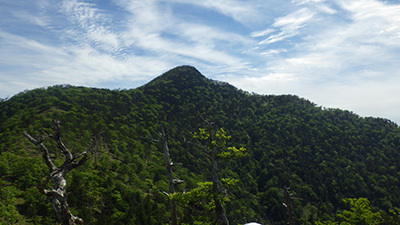 Shakagatake (dominant peak of the southern part of this area). At present, in addition to spiritual mountain climbing centering on Mt. 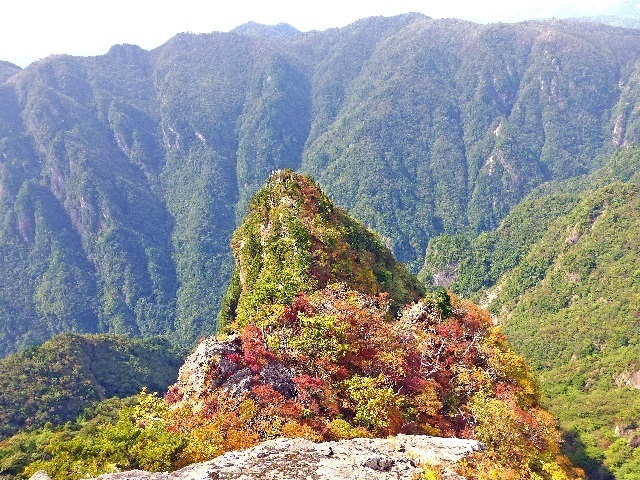 Sanjogatake, the mountains have been used in various ways including hiking and competitive mountain climbing. The temperate mixed needleleaf and broadleaf forests and subalpine coniferous forests grow in the Omine Mountain Range. These forests are habitat for a number of wild animals including endangered Asian black bears on the Kii Peninsula and Japanese serows that are designated a nationally protected species. Known as a site that receives some of the highest amounts of rainfall in Japan, the area boasts average annual precipitation of approximately 3,500 millimeters. The precipices, waterfalls, and other formations created through erosion caused by heavy rains have created a majestic landscape. 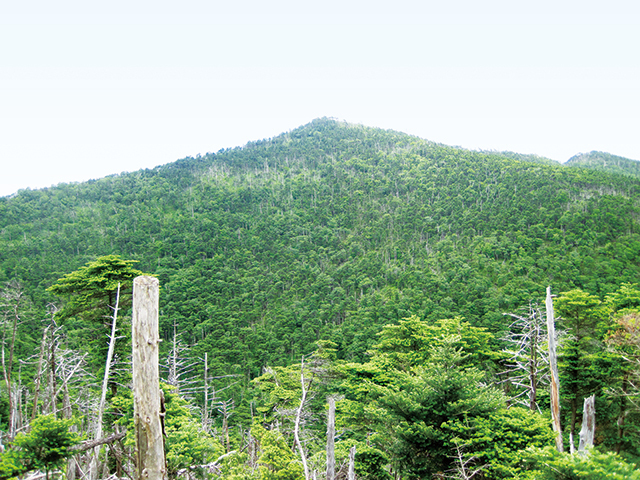 A scenic highway takes visitors near the summit to offer a full-fledged mountain climbing experience of a nature walk and hiking near the summit. 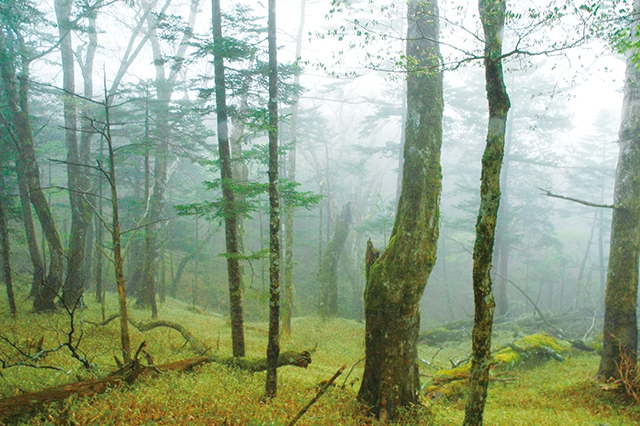 This vast area of 450 ha is home to a wide variety of plants and liverworts, such as Japanese beech trees and Abies homolepis, besides serving as a habitat for numerous wild animals including endangered local populations of Asian black bears of the Kii Peninsula, sika deer, and other large animals. There are also living creatures named after Odaigahara such as Odaigahara Sanshouo (Hynobius boulengeri). 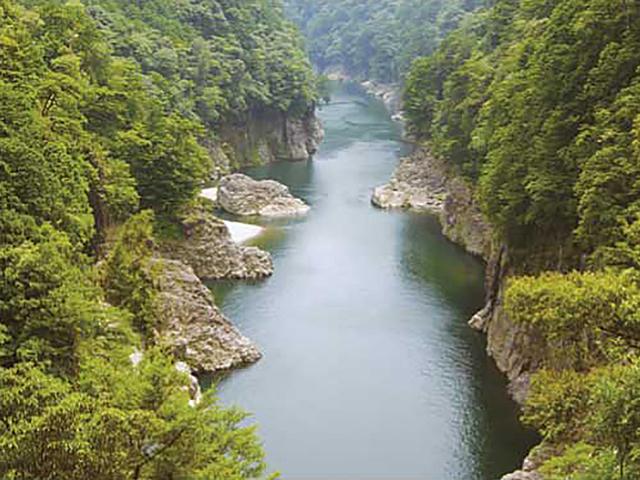 The Dorokyo Gorge located midstream of the Kitayama River is a gorge situated downstream basin of the Kitayama River, which is a tributary of the Kumano River fed by waters flowing down from the Omine Mountain Range and Odaigahara. 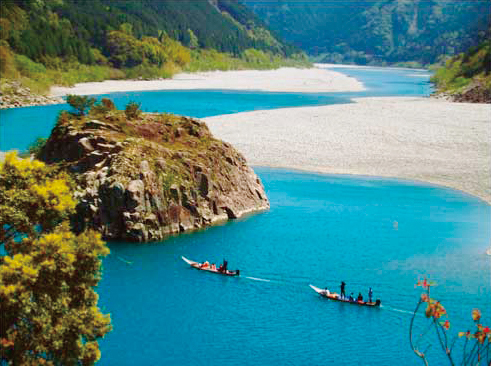 The gorge is divided into several sections from upstream to downstream: Oku-Doro, Kami-Doro, and Shimo-Doro. Shimo-Doro is also referred to as Doro-Haccho. This area features a diverse array of linked scenic elements consisting of vertically sheared cliffs created through the erosion of geological layers formed by the solidification of magma, oddly shaped rocks, and deep pools of water. Board a hovercraft or other vessel to explore the beautiful allure of this extraordinary gorge. Shichiri-mihama Beach extends from Onigajo, famous for its sea cliffs in Kumano City, to the mouth of the Kumano River and consists of a straight-line coastal area that is rare for the Kii Peninsula, which is primarily bordered by a complex coastline. Against the backdrop of a forest of black pines and other seacoast species of trees, the broad cobble beach draws a gentle arc and beautifully showcases the white waves of the Pacific Ocean. The Shinto shrine previously located on a sandbank of the Kumano River was transferred to the current location after heavy floods occurred during the Meiji era. From here, visitors can follow the pilgrimage road on the river leading to the Kumano-Hayatama Taisha Shrine by a riverboat. 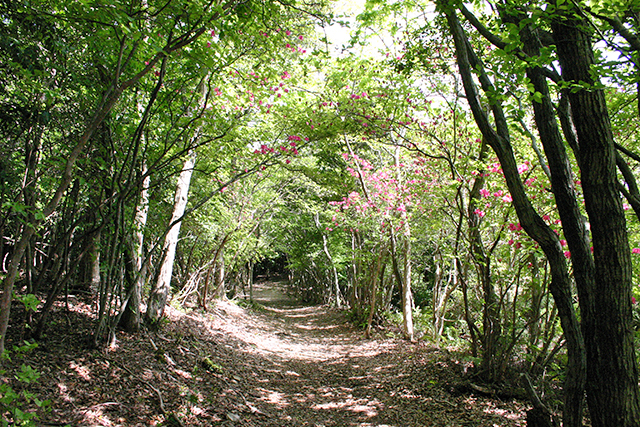 Situated at the mouth of Kumano River, there is a footpath leading from towering Mt. Chihogamine behind the shrine to the Kamikura-jinja Shrine (main shrine), a place where an enshrined deity is said to be descended for the first time. Designated as a World Heritage Site, the periphery of Kumano-Hongu Taisha Shrine has been traditionally known as a spa area. 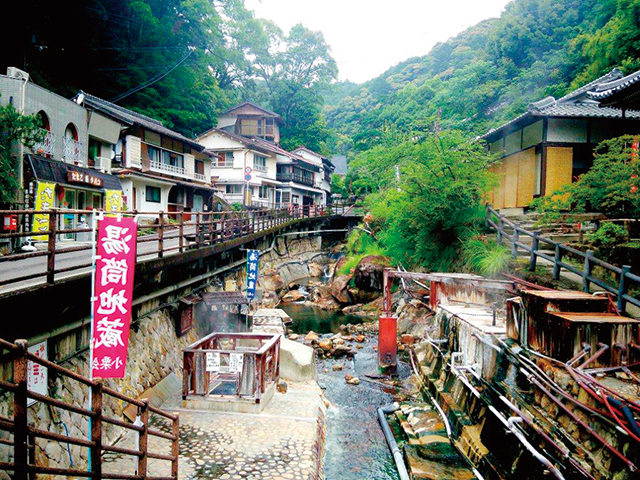 The Kawayu Onsen Resort, Yunomine Onsen Resort, and Watarase Onsen Resort exhibit townscapes with a nostalgic feel. 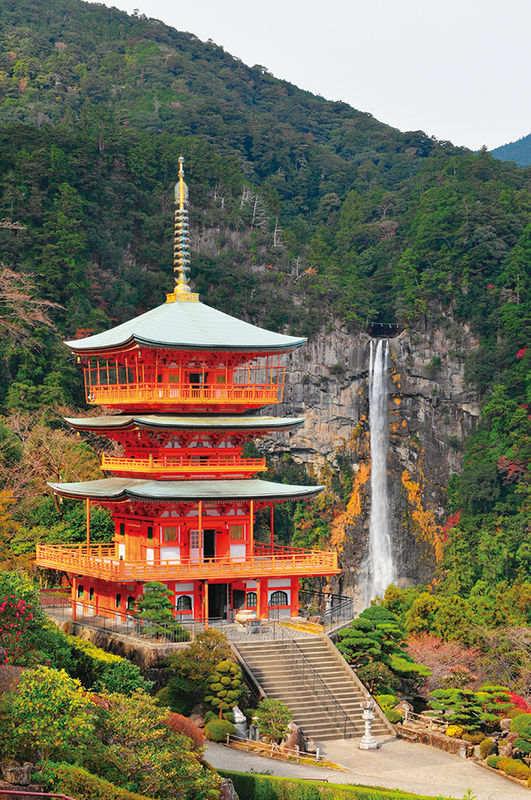 With Nachino-Otaki Falls as an enshrined deity, Nachi Falls is Japan's tallest waterfall. The evergreen forests protected as the Nachi primeval forest spread behind the falls. 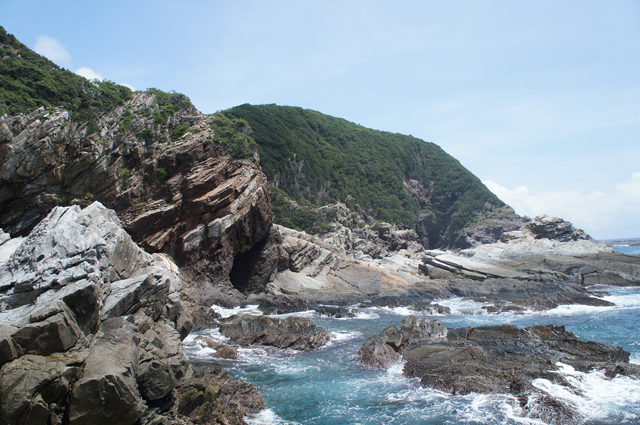 Steep cliffs soaring out of the sea to a maximum height of 50 m. One of the Geo Sites of the Nanki Kumano Geopark. Enjoy the dynamic scenery from the view point. This area was a leader in the National Trust in Japan. 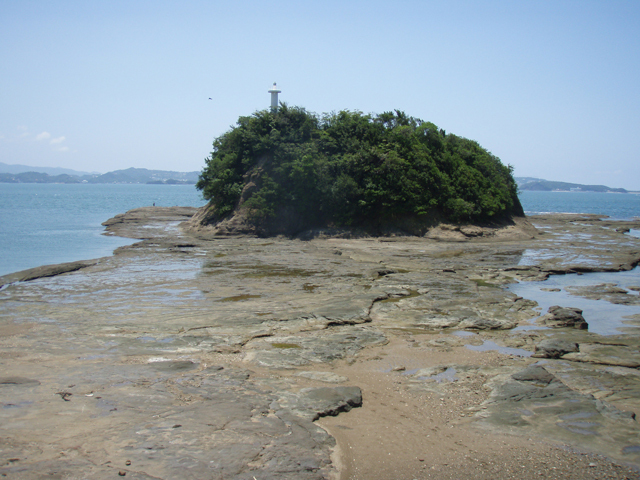 Located near the center of Tanabe City, it provides the best and safest way for children to enjoy coming into contact with the forest and the sea, and to learn about the connection between the two. View the scenery of Karekinada-Sea, centered on Okino-Kuroshima Island and Rikuno-Kuroshima Island, from the 4.5 km Ohechi Road over the mountain pass. 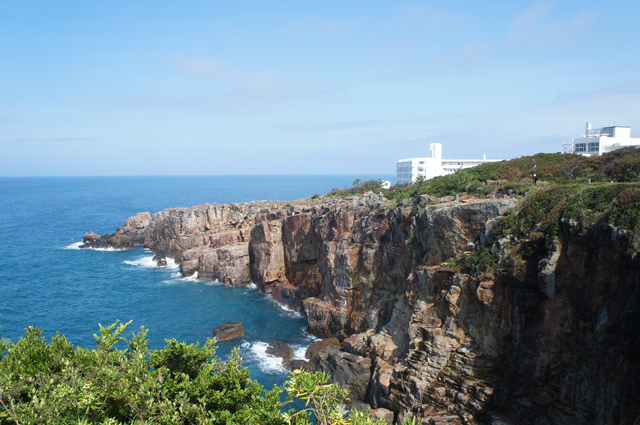 The plentiful scenery continues in the changes in the topology along the coast from Susami Town to Kushimoto Town. The scenery of the sun going down is much enjoyed and often photographed by tourists. 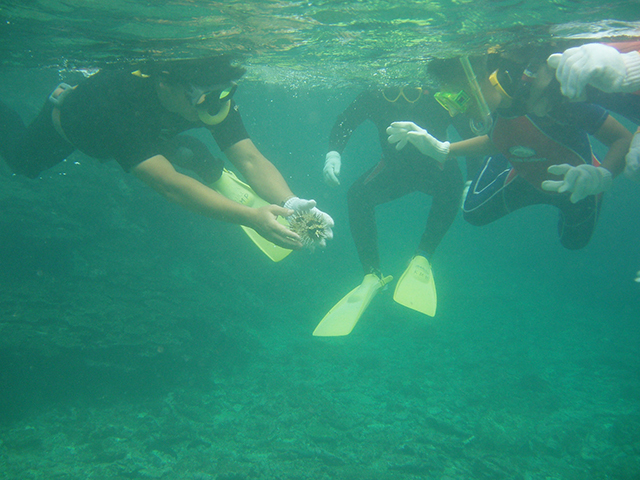 Snorkeling is one means of relaxing and enjoying the beautiful underwater scenery of the Kumano region. A mask and snorkel allow a close observation of the coral and fish life found along the coast. 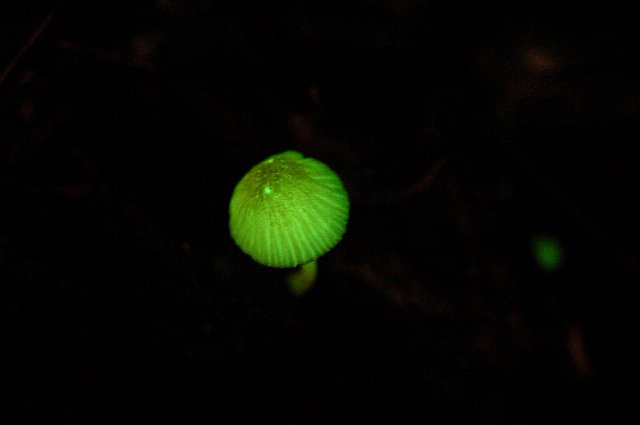 A luminescent green mushroom. Frequently found growing on the decayed trunks of Castanopsis sieboldii between the middle of May and summer. 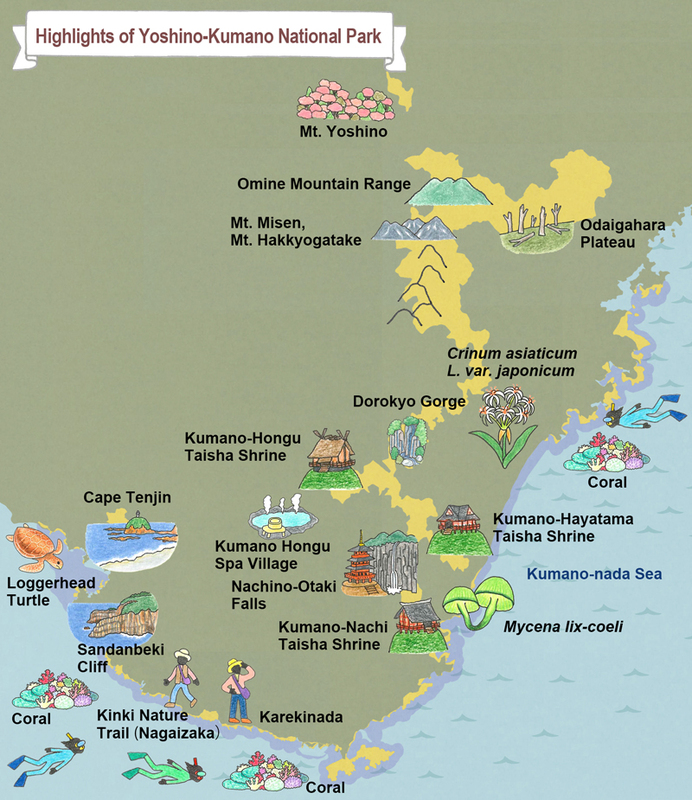 The south-east of the Kii Peninsula is a major habitat of Mycena lux-coeli, and observation groups are met annually on the Ugui Peninsula (Nachikatsuura Town, Wakayama Prefecture). 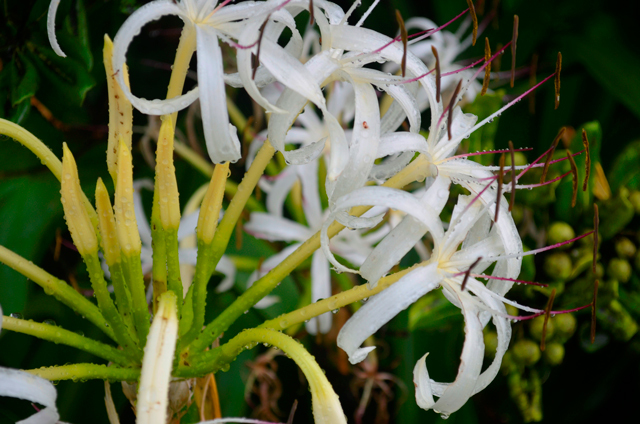 A species of the cluster amaryllis family. Blooms in summer with a white flower. A cork-like seed, which floats in water and is distributed by sea currents. 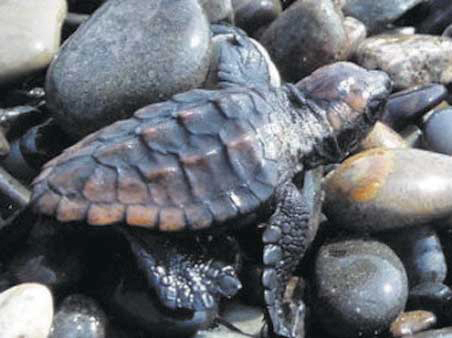 Distributed widely along the coast of the Kumano region. 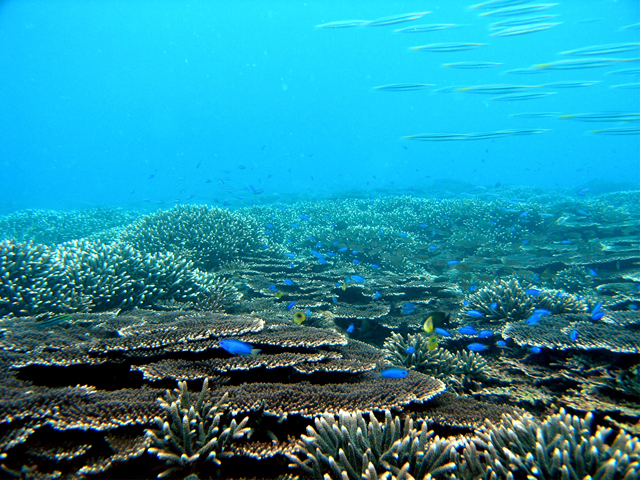 Stone corals and tropical fish are found along the coast of the Kii Peninsula due to the effects of the warm Kuroshio current. Diving and snorkeling in these regions allow enjoyment of the beautiful underwater scenery. 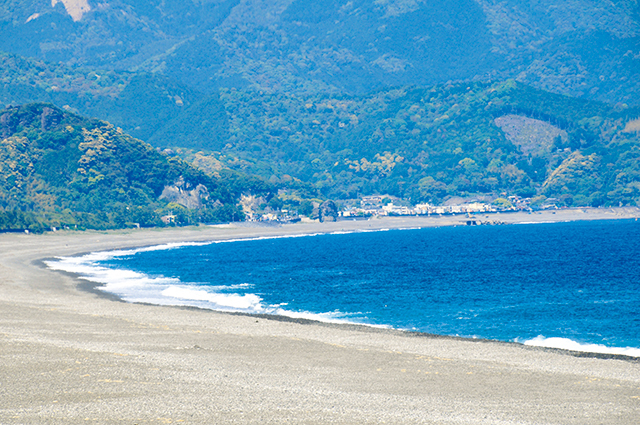 Beautiful Senri hama Beach near Minabe Town is the largest egg-laying site in Honshu for loggerhead turtles (to ensure that this beautiful beach, much-loved by locals, remains pristine for the future, town permission is required for viewing).